If things get a little quiet around here for the next month, it’s because I signed up for NaNoWriMo again this year. I reached the 50,000 word goal the previous two times I participated in 2005 and 2009 but I think it’s unlikely I’ll get that far this year. Partly because in previous years I had a better idea of what I wanted to write and partly because there are other things I’d like to do this month, especially taking pictures, editing pictures, and updating my site. Goodness am I behind. And partly because I haven’t been sleeping as well lately and am often tired at the end of the day, normally my favorite time to write. The other day I fell asleep as soon as I finished eating dinner, for a night owl like me that’s rather embarrassing so let’s just keep that between us, shall we. 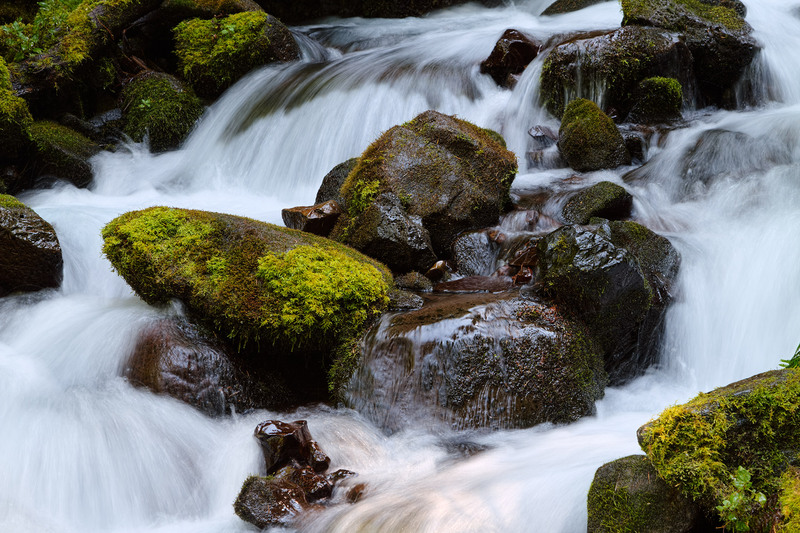 In the meantime enjoy this lovely mountain stream flowing over moss-covered rocks, taken on the trail above Wahkeena Falls in the Columbia River Gorge. I went hiking a couple of times in the Gorge in the weeks before my Wyoming trip, trying to get myself back in hiking shape while lugging the camera gear around. I love, love, love the tiny little horns of a bison calf and finally had the chance for a close-up in the Tetons. 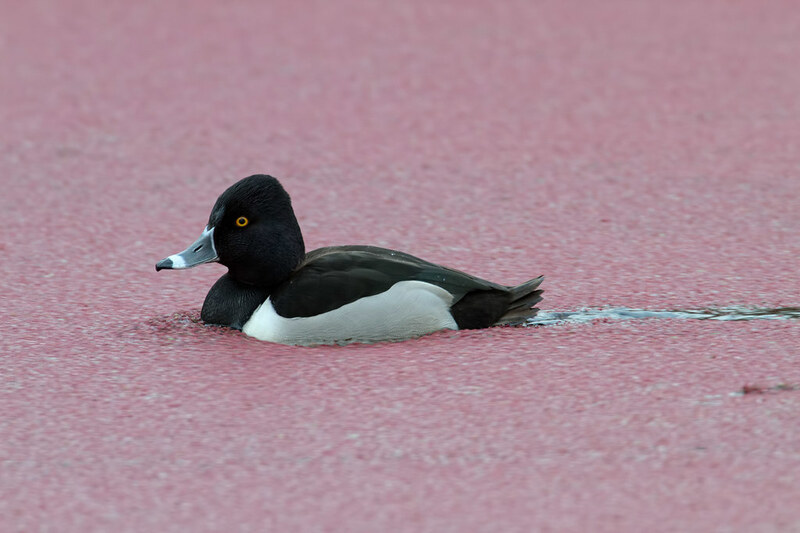 A male ring-necked duck swims through duckweed in Bower Slough. In my many years and many travels, I’ve encountered only one universally accepted truth, one thing everyone agrees on, and that is this — when even Scout won’t sleep in her warm bed, it’s hot. We had a lovely cool and wet spring here in the Northwest and escaped the summer with but a few hot days at the end. Scout is such a creature of habit that she likes to sleep in her warm bed no matter the temperature, so as the weather warms I unplug it to extend her comfort as long as possible. 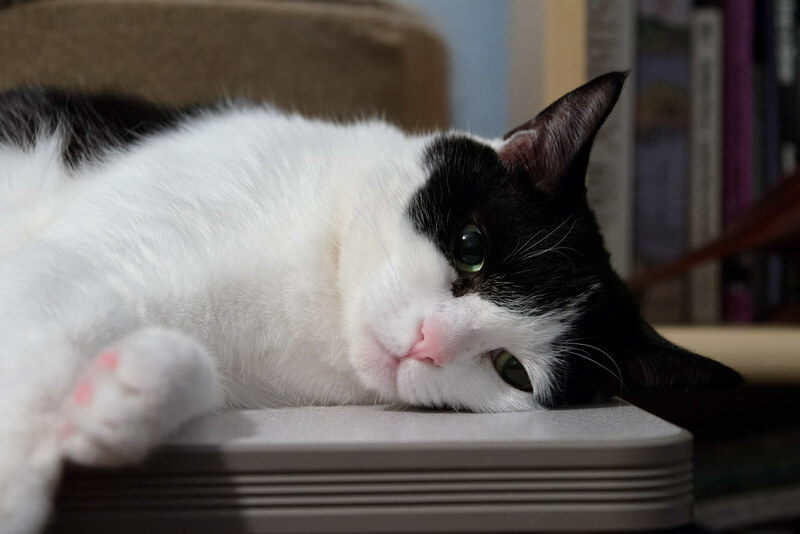 This picture is from one of those hot days in early September when she stepped out of the bed behind her and lay down on the cooler desk. Recently I noticed that the bed doesn’t seem to be heating up anymore, even when plugged in, which puts us on the horn of a dilemma: do we leave it as is, knowing it won’t keep her as warm during the winter, or swap it out for a functional one but risk upsetting her routine? For now we’re letting sleeping cats lie.